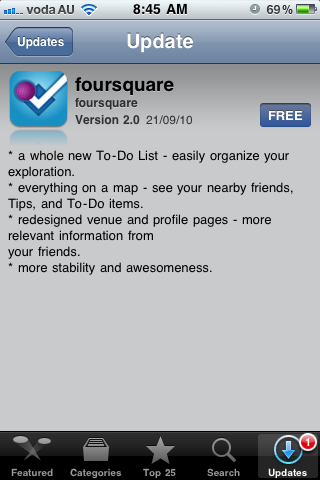 Foursquare have released the latest update update to their iPhone application – version 2.0. We always knew V2.0 was going to be a big release and there are a number of new features and the overall presentation of the app has changed somewhat. – a whole new to-do list which allows you to organise in a simpler manner the places you want to visit. – the Google map integration now also shows tips, to-do’s aswell as friend locations. – Venue pages have been given a fresh layout. If you are a Foursquare, let us know what you think of the latest update.